It is pretty much a given that, living in the Pacific Northwest, we eat a lot of salmon. Even this time of year, when there isn’t anything available in the stores except farm-raised, color-added salmon, we can only go so long before giving in and buying some, usually in enormous fillet form from Costco. 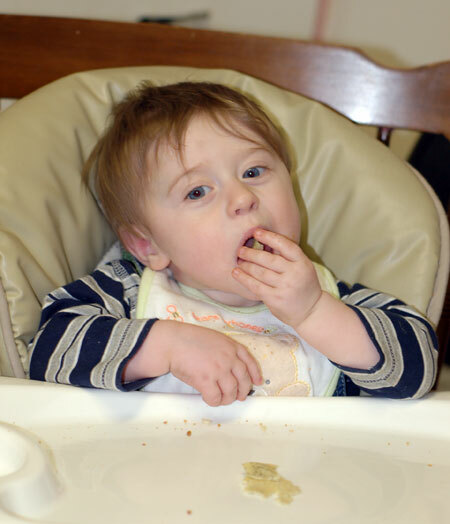 Nolan loves salmon, and for the most part it makes for a quick-fix dinner, both marks in the plus column for us. 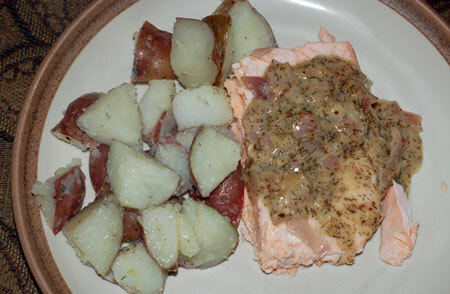 So this post is a melange of salmon recipes we’ve made in the past month or two, with a big finale to keep you tuned in. 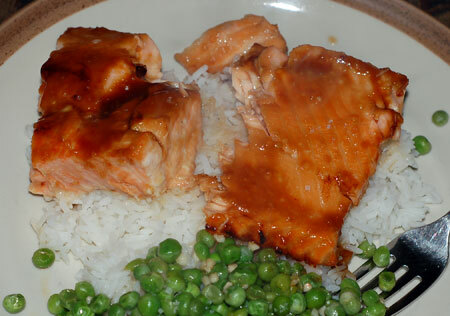 This was an easy miso-glazed salmon, based on this recipe from Cooking Light. It was tasty, but quite a bit sweeter than I had anticipated, so if I make it again, I will definitely hold back on the brown sugar, or maybe add a balancing acidic component. The next recipe, for poached salmon with a creamy mustard sauce, was a greater success, although it might not be as pretty to look at. I adapted the easy sauce to my ingredients with great success: shallots for green onions, and a good dose of dried dill added in because it sounded good to me. I used the remaining salmon the next day to make a chowder that was, frankly, so good I’m tempted to make the poached salmon again just for the leftovers. It was completely improvised, but here is the gist of what I did: I chopped and sauteed two handfuls of onions with some garlic, and then added 1/4 C white wine and 2 cups of water mixed with a teaspoon each of Better Than Bouillon chicken and clam base (mostly because I was running out of the chicken base). I chunked up some red potato and boiled that in the broth for 10 minutes or so, until it was tender, and used a masher to smush them a little and thicken the sauce while still leaving lots of chunks for texture. 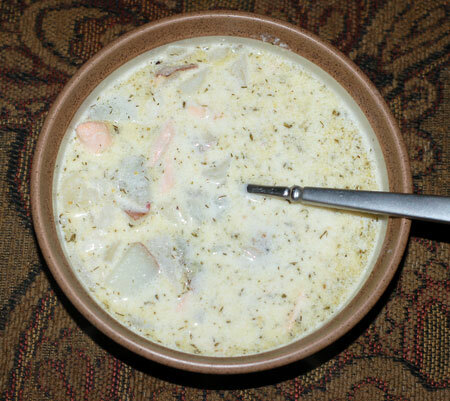 I wanted to underline the flavors of the original meal, so I added a cup of cream, threw in some dill, a teaspoon or two of mustard, and then broke up the leftover salmon into the chowder, sauce and all. It was fantastic, and stretched the salmon out for an extra day or two. This was a smoky salmon bisque I made last week when I had about 3/4 lb of salmon scraps leftover from another meal. 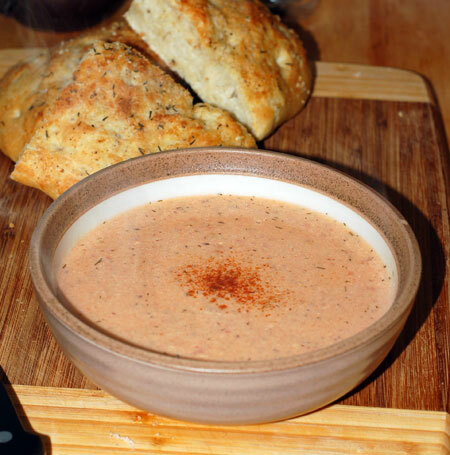 I wanted to try something new, so I adapted a recipe for smoked salmon bisque. I had to leave out the cilantro and leek and use rehydrated wild mushrooms; I used homemade shrimp stock and only fresh salmon, injecting a smoky flavor with smoked salt and a bit of smoked Spanish paprika instead. It turned out alright, but I think the main problem is just that I don’t actually care for seafood bisques all that much, no matter how much I tell myself otherwise. There is something about pureeing fish that just doesn’t sit right with me. I left my bisque on the chunky side, but the texture still bothered me because it seemed gritty. 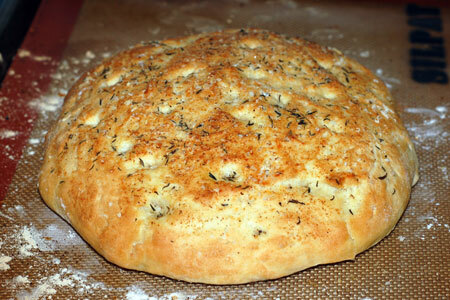 It did taste good, though, and I served it with homemade Parmesan focaccia, which made Jeremy’s day.
. I topped it with fleur de sel, coarse pepper, sprinkles of thyme and garlic powder, and freshly grated Parmesan, plus a generous drizzle of olive oil. 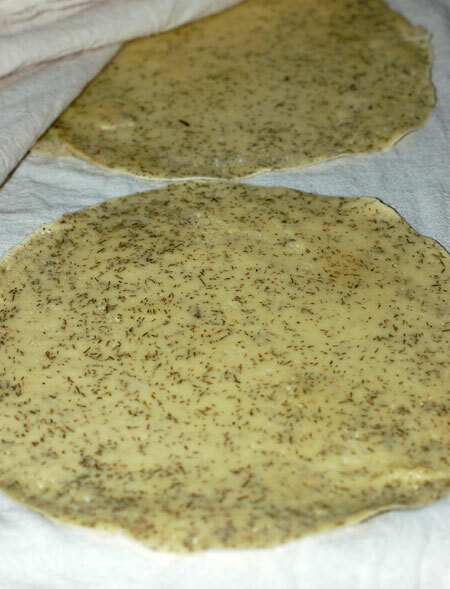 I was able to make two focaccias and a large pizza with the dough over several days, all of which were very tasty and prompted me to immediately make another batch of dough. You may be picking up on the pattern here: I tend to pick out really easy salmon recipes with just a few ingredients, and use any leftovers for some sort of chowder. It fits the bill on most occasions, but I wanted to make something more interesting this time. I started looking into Italian recipes to marry with the focaccia, and a unique recipe for salmon cannelloni in a lemon cream sauce. Rather than using fresh pasta wrapped around ground meat, this recipe calls for homemade crespelle (Italian crepes, essentially) wrapped around narrow strips of salmon fillet. I was a little skeptical, but it suited my needs, and I had nearly all the ingredients for it on hand, so I gave it a shot. I’ve made crepes before and they don’t pose too much of a problem. For these, I used dried dill instead of the tarragon called for, purely from personal preference: we aren’t big on licorice-y flavors. The recipe called for a 10″ nonstick skillet, though, and I have just 8″ and 12″ ones, so I slightly adapted the method of spreading the batter. Rather than pouring in too much, swirling the pan, and pouring off the excess, I used my 12″ skillet, poured batter into a 1/4 C measuring cup then into the hot skillet, and gently used the back of the cup to spread the batter, using the lightest touch I could and stopping the moment I felt it start to set up. I was quite pleased with the size and thickness of the resulting crespelle. Nolan thought they weren’t half-bad, and the little one I made for him and tore up into bite-sized pieces kept him occupied while I continued working. I made some minor adjustments to the lemon cream sauce, and in place of the shallot butter, I took advantage of a lone leek, sautéing it with a little butter and garlic. It ended up being a bit skimpy for me, so I’ve adjusted the recipe to call for 2 leeks instead. Nolan did great watching me run around the kitchen working…until I had to stand still and wrap up the cannellonis, then he decided he was done being patient. I had just enough time to grate some fresh Parmesan over the dish and shove it in the oven before his tantrum picked up steam. These were delicious, and one of the most impressive looking meals I’ve made in quite some time—it would be a good one to make for guests. Blend together eggs, water, flour, dill and salt in a blender until smooth. Lightly brush a 10- or 12-inch nonstick skillet with a film of melted butter and heat over moderate heat until hot but not smoking. Ladle about 1/4 cup batter into skillet, tilting and rotating skillet to coat bottom, or use the back of the measuring cup to very gently spread batter. (If batter sets before skillet is coated, reduce heat slightly for next crespella.) Cook until just set and underside is lightly browned, about 30 seconds, then invert crespella onto a clean kitchen towel in one layer to cool. (It will be cooked on one side only.) Make 5 more crespelle with remaining batter in same manner, brushing skillet with butter as needed and transferring to towel as cooked, arranging them in one layer. Heat butter in a 1- to 2-quart heavy saucepan over moderately low heat until foam subsides. Add flour and cook, whisking, 2 minutes. Add clam juice, water and lemon juice in a slow stream, whisking, then bring to a boil, whisking. Reduce heat and simmer, whisking occasionally, 5 minutes. Stir in cream, zest, and pepper, then remove from heat. In a small skillet over medium heat, melt 1 T butter and saute leek and garlic until softened. Season with salt and pepper, remove from heat and set aside. Put 1 crespella, pale side down, on a work surface. Spread a layer of leek in a line across the center of the crespella, cover it with a salmon fillet, season fish lightly with salt and pepper, and fold crespella around salmon, leaving ends open. Transfer to baking dish, arranging, seam side down, in sauce. 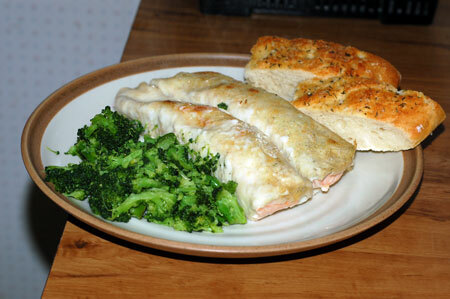 Make 5 more cannelloni with remaining salmon and crespelle in same manner, arranging in baking dish. Spoon remaining sauce over cannelloni. Grate a light layer of Parmesan cheese over the surface of the crespelle. 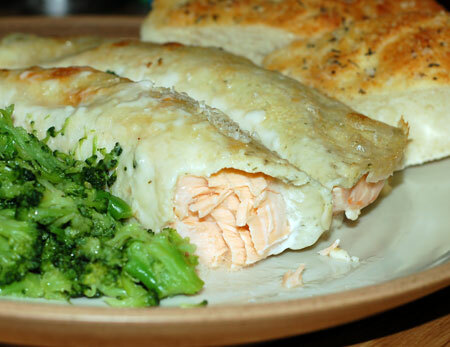 Bake until salmon is just cooked through, sauce is bubbling, and Parmesan is beginning to brown, about 15 to 20 minutes. Allow to settle for several minutes before serving.